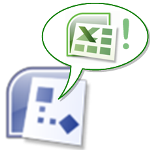 Visio users are excited about the data features in Visio 2007. 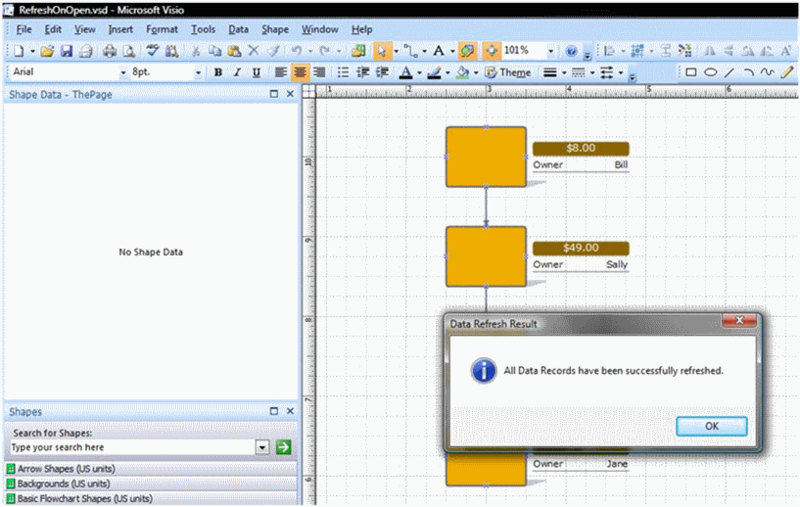 Can Visio provide an automated way to refresh the attached data every time the diagram is opened, so I don’t have to remember to refresh the data myself? I want to see the very latest version of the data every time I open the diagram. 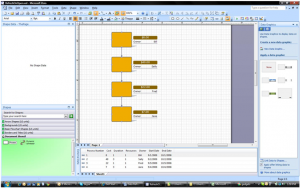 Today’s article shows how to accomplish this with just a wee bit of Visio automation code. The article details step-by-step instructions on how to implement this feature. Users are welcome to steal adaptively re-use this code to suit their needs and provide this functionality in their own Visio diagrams. This is another great guest-post created, written by David Edson. David is a fellow Microsoft Visio Most Valuable Professional (MVP), a one-time co-worker of mine at Visio Corp., and is currently the CTE/Director of Consulting Services at visibility.biz. This article will also be published on EasierWithVisio. With the introduction of Data Connectivity under Visio 2007 Professional Edition, more and more Visio users are beginning to create data-aware / data-connected Visio Diagrammes. From everything from with Network Asset Management Diagrams to Organizational Structure Diagrammes, these data-connected diagrams are becoming mission-critical visualizations of the up-to-the-minute status of the health and profitability of many corporate enterprises. As the popularity of these data-connected diagrammes increases. So does the request to have these diagrams refresh their view of the data each and every time the Visio diagramme is opened. I’m constantly asked if this is possible without the Visio user remembering to refresh the data manually by selecting Data 4Refresh Data… from the Visio Data menu. Fortunately, the answer is a resounding “YES!! !”, by using just a wee bit of Automation code. Now… don’t turn running, thinking, “but I don’t know how to code…” The following will walk you through step by step and show you that it’s actually very easy to implement this feature in Visio 2007 Professional edition. We’re going to check to see if the document actually has any data attached to the document. If, and only if, the document has data attached to it, we will obtain a reference to the datasets attached to the diagram and refresh those datasets. We’ll then update those datasets and post a wee message to the user of the document letting them know that we have successfully updated the data. Although the automation code that I am going to share with you could be authored in any Microsoft-supported language including Visual Basic for Applications (VBA), Visual Basic 6.0 (VB6), Visual Basic .NET (VB.NET), C++, or C#.NET, I’m going to provide it using VBA, since every user already has VBA in their individual PC, as it is already installed with every copy of Office and Visio. 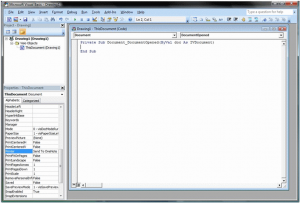 Step 1 – Opening the Visual Basic for Applications Integrated Development Environment (VBA IDE). You will be presented with the VBA IDE. 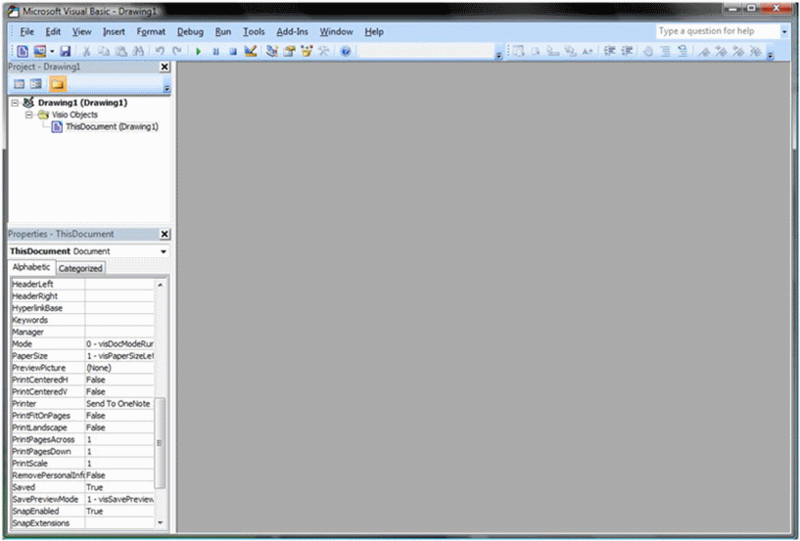 You will see, by default a Project Explorer in the Upper-Left-Hand and a Properties Window in the Lower-Left-Hand of the IDE. You will most probably have an empty area at the Right 3/5 of the IDE. Next, Double-Click on the Blue Entry in the Project Explorer that is entitled : “ThisDocument (Drawing1). 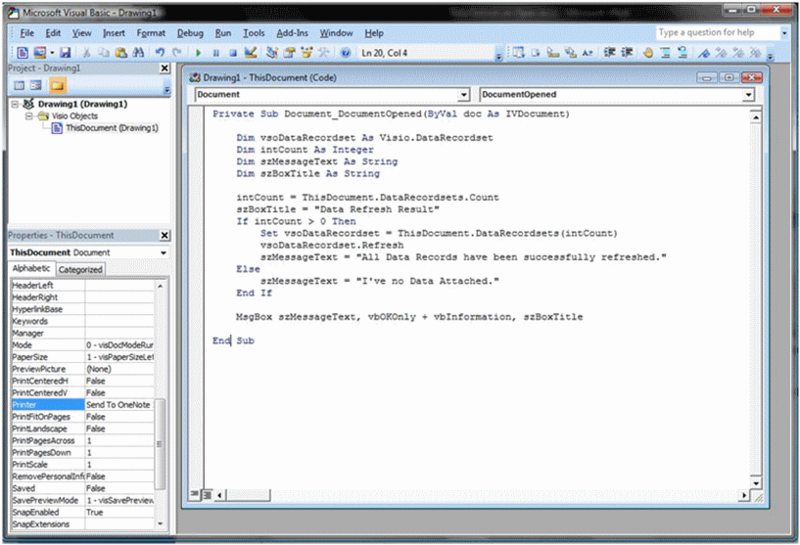 A new Code Window will open up in the IDE to enable you to author code for your VBA project. There are two drop-down lists at the top of the Code Authoring Window. The drop-down list on the left has an entry in it that is labeled (General). The drop-down list on the right has an entry in it that is labeled (Declarations). Select the drop-down list on the left and choose the entry listed as “Document”. Looking at the code window, your cursor should be blinking in the empty line between the line beginning with the word Private, and the line beginning with the word End, This is where we are going to begin writing the automation code. Each and every time the document is opened, any instructions we place in this code subroutine will be executed. These variables are the storage holders for the data and objects that we will use and manipulate to perform the actions within our code. The Object variable vsoDataRecordset is the Object representing all of the data records that are attached to the document. The integer variable intCount is the integer data type object representing the count of the number of data recordsets we have attached to the document. The string variable szMessageText is the string data type object representing the message we want the user to see when we execute the subroutine. 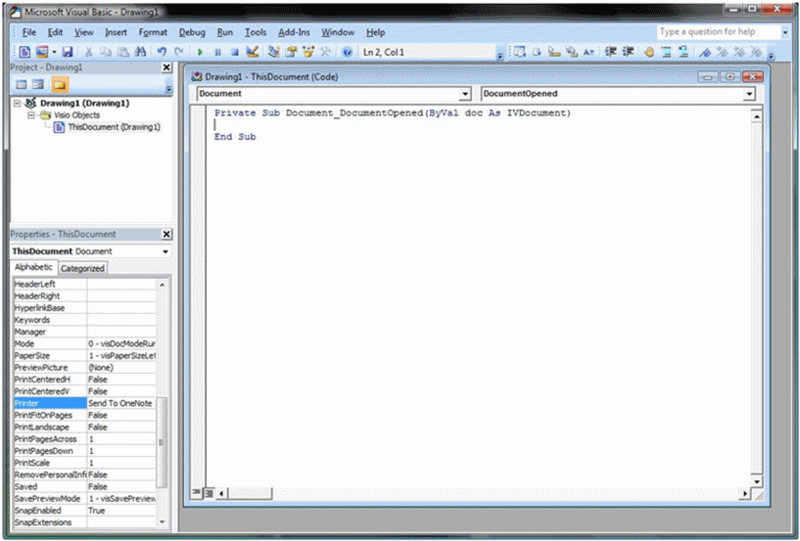 The string variable szBoxTitle is the string data type object representing the Title to be placed in the VBA Message Box that will hold the Message Text we will provide. intCount = ThisDocument.DataRecordsets.CountszBoxTitle = "Data Refresh Result"
The intCount variable holds the value for the total count of the data recordsets that are associated with this document. The string variable szBoxTitle holds the string value “Data Refresh Result” that will be displayed as the title to the Message Box we will provide as feedback to the user. The Object Variable vsoDataRecordset holds a reference to the DataRecordsets Object that includes all of the data records that are currently attached to the current document. The Refresh Method of the DataRecordsets Object does the actual refreshing of all of the attached records. The string variable szMessageText holds either the string value “All Data Records have been successfully refreshed” or the string value “I’ve no Data Attached.” Depending upon if the count of the recordsets is greater than 0 or not. All of this is structured in the classic If, Then, Else, End If structure. Finally, a call is made to the MsgBox function, passing it the szMessageText and the szBoxTitle variables as well as telling the function that it should display an Information Icon and provide an OK only Command Button. 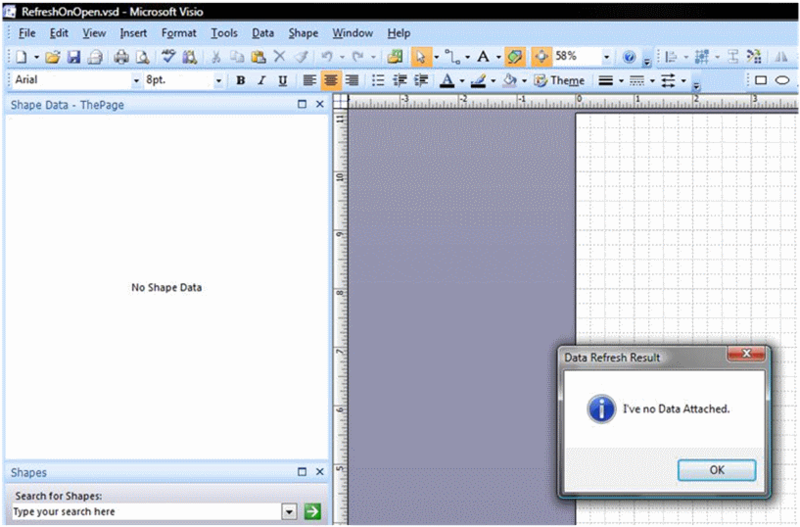 Close the VBA IDE by selecting File 4 Close and Return to Visio from the VBA File menu. 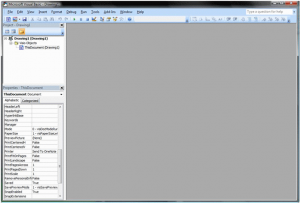 From within the Visio diagramming environment, select File 4 Save As… from the Visio File Menu. Save your Visio diagram under any convenient folder and filename; I’ll save mine on my desktop as RefreshOnOpen.vsd. Next Close the diagram by selecting File 4 Close from the Visio File menu. Next, reopen the file that you just closed by selecting File from the Visio File Menu and selecting the file from the Most Recently Used File Listing below the File Menu; in my case I’ll re-open the RefreshOnOpen.vsd file. When the File opens, note that immediately, a Message Box is displayed stating that I do not have any data records attached to this diagram, just as expected. Next, Save and Exit the Visio Diagram. The key to this functionality is that every Visio diagramme has an event called DocumentOpened that can easily be accessed via automation. Because absolutely every aspect of the Visio environment can be accessed via the Object Model, the DataRecordsets Object can call the Refresh Method and therefore the data records may be refreshed each and every time the diagramme is opened. The If statement ensures that if no data is attached, we will not get automation errors and will be properly notified of the success or failure of the refresh based on the presence of attached data. There you have it. Not so hard after all, right? Please “Adaptively Reuse” this code, and increase your productivity with Visio. This is great. Is there a similar way to make data refresh when using the ActiveX viewer? I’d like to use a pivot diagram for a workflow dashboard. It works great via Visio, but I’d like to make the dashboard available to all my MOSS users via MOSS without then having to open Visio, plus most don’t have Visio. Are you talking about the Visio Viewer or the Visio ActiveX Control? If you have the ActiveX control on a WinForm, then you should be able to adapt the VBA code in this template to your application’s control. The viewer probably can’t handle this, as it deals with a static drawing and can’t edit anything. Plus the parameters of course. 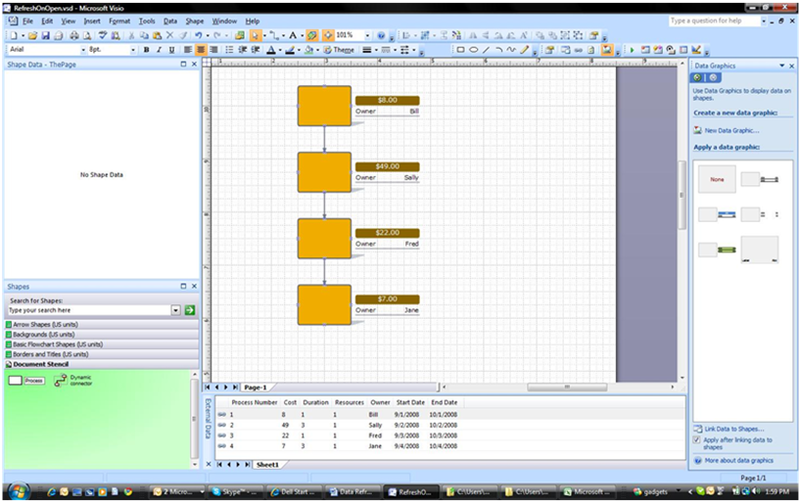 Looks like the Visio Viewer to me. 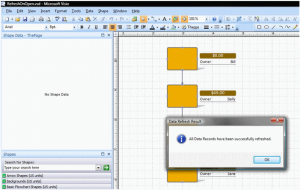 To get any updates in your visual, you would have to edit the underlying Visio diagram. This can’t be done through the Visio Viewer control – it just presents the Visio diagram, read-only-ish. Yes, it’s exactly the 2010 features I want, but don’t want to wait. 🙂 Don’t want to spend time developing status dashboards either if there is a way to use Visio. Hey there, works like a charm, but there is a catch. If and when the visio/data files are moved to another location, the linked data no longer works, cause it can’t find the data file. Is there a way to add the data file to the visio sheet and create a data connection that way? Then if the visio report moved, so would the data file, and no connection errors. If not, is there a way to use the current visio report “path” in the connection string, so if the report was moved, the data file would have to at least be in the same path location? Any info you could provide would be extremely helpful. So if your data source is always in the same folder as your Visio drawing (a reasonable thing to do! ), then you could concatenate that path together with the Excel file’s name. It is really fascinating. Is there a way that only Data gets refreshed and Graphics remain as it is. I have some graphics which needed some adjustment but everytime I refresh data it also gets modified.